A furthering of MOTORINO’s pursuit of human-electric hybrid drive synergy, the LTi is the dream electric bicycle for those desiring not only the looks and pedaling performance of a high-end non-electric bike but also ample power when they need it. The low-profile appearance of the oversized-tube all-aluminum frame is enabled by the long, slim battery pack that is neatly concealed in the down-tube. 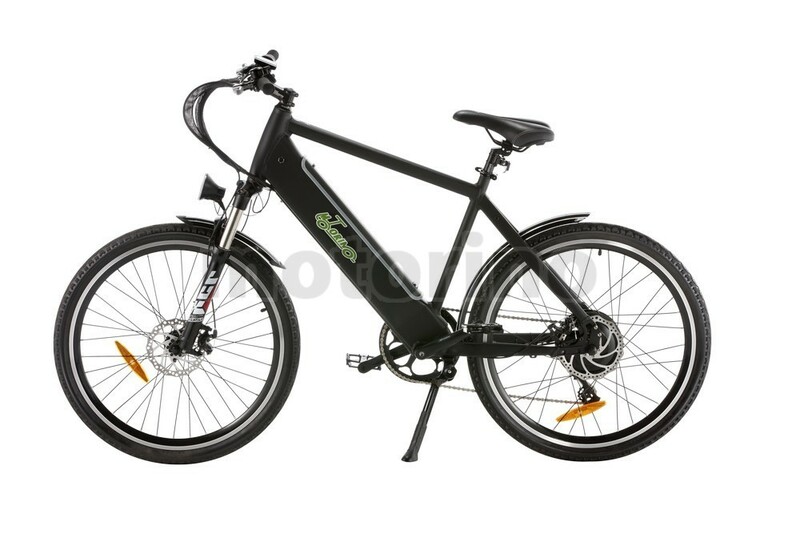 With the highest “energy density” currently available, the surprisingly light and small 48V 10 Amp-hour Lithium-Polymer pack can power a 25km range in regular city riding, without any pedaling. Of course, range can always be greatly extended by the rider’s pedaling input. The Motorino LTi features a high-torque 500W (the highest power allowed in its class) motor, providing ample torque to handle the steepest roads. It also features high-quality components including a Shimano trigger-shift 24-speed drive-train, 180mm Tektro disk brakes front and rear, and a Zoom front suspension. The Motorino LTi has two control modes: “power-assist” provides five user-selectable levels of assistance that are automatically engaged when the rider pedals, or there is “power on demand” delivered with just a twist of the throttle-grip. Mode, battery voltage, speed, instantaneous wattage, trip distance, and odometer distance are indicated on the bar-mounted backlit LCD display panel.